Our Penang Icon City outlet will be offering Durian beverages Buy 1 Get the Second at 50% 😁 Come get the fragrance of our King of Fruits packed in our creamy cheese. #duriancheesetea. It's only for a limited time only starting from 1st August, Monday, so grab your friends and come to our Icon City outlet! 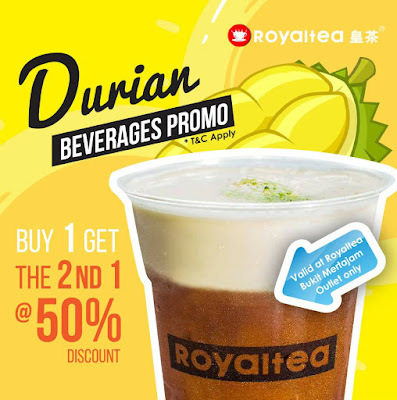 Promotion is only valid for durian beverages. 2nd drink of equal or lesser value for 50% off. All drinks offered are subject to availability. While stock last. Valid at Royaltea Bukit Mertajam Outlet only.